Q&A: Regulations for Back-Up Anesthesia Machine Availability? What should we tell patients preoperatively? And, how should we manage their intraoperative care? A shocking and dramatic picture from the Fire Safety Video. Safely manage fuels (alcohol-based skin preps, drapes, oxygen masks, nasal cannulae, patient’s hair). Despite the fact that we know which patients are at risk for fire and understand how to prevent a fire, SURGICAL FIRES CONTINUE TO OCCUR. In many of these fires, a common characteristic is the use of supplemental oxygen via an open delivery system, thus creating an oxidizer-enriched atmosphere in proximity to an ignition source. Anesthesia professionals have direct control over the delivered concentration of oxygen and the method of its administration. The authors of this report propose that anesthesia professionals can contribute to the protection of patients at risk for surgical fires by reassessing the administration of supplemental oxygen using the algorithm shown below. Preventing surgical fires. Sentinel Event Alert. The Joint Commission. 2003 (www.jointcommission.org). Association of periOperative Registered Nurses (AORN). AORN guidance statement: Fire prevention in the operating room. AORN J 2005;81:1067-75. Fighting fire with fire safety. Graling PR. AORN J 2006;84:561-3. New clinical guide to surgical fire prevention. Health Devices. ECRI Institute. October 2009:314-332 (www.ecri.org). 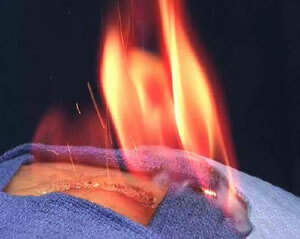 Prevention and management of surgical fires (video). Anesthesia Patient Safety Foundation. 2010 (www.apsf.org). Preventing surgical fires: collaborating to reduce preventable harm. Food and Drug Administration. October 2011 (www.fda.gov/preventingsurgicalfires). *The following organizations have indicated their support for APSF’s efforts to increase awareness of the potential for surgical fires in at-risk patients.